These individual savoury tarts take their inspiration from spanakopita, a classic Greek recipe. 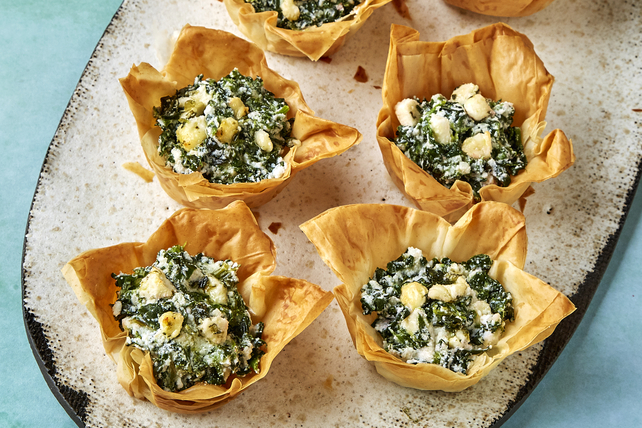 These crisp phyllo tarts are filled with a mixture of spinach, feta, garlic, mint and lemon - perfect to serve as an appetizer or super side dish. Mix all ingredients except phyllo dough and butter until blended. Brush 1 phyllo sheet lightly with butter; cover with 4 of the remaining phyllo sheets, lightly brushing each sheet with some of the remaining butter before covering with next phyllo sheet. Cut into 6 (4-inch) squares. Press 1 phyllo stack into each of 6 muffin pan cups. Repeat with remaining phyllo sheets and butter. Bake 10 min. or until golden brown. Cool in pan 5 min. Remove to wire rack; cool slightly. Prepare recipe as directed except cut each phyllo stack into 12 (1-1/2-inch) squares. Press into 24 mini muffin pan cups; fill with spinach mixture. Bake as directed. Makes 24 mini tarts. Substitute fresh oregano for the mint.